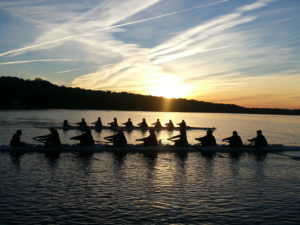 The Ohio State University, Humboldt University and Trinity College, all 2014 NCAA national champions, topped the postseason USRowing/Collegiate Rowing Coaches Association Collegiate Rowing Polls presented by Pocock Racing Shells. Ohio State earned 25 first-place votes to take the No. 1 spot in the Division I poll, while University of California took the No. 2 spot, followed by Brown University in the No. 3 position. Stanford University and University of Virginia rounded out the top five. In the Division II poll, Humboldt State University had five first-place votes and finished on top. Nova Southeastern University finished in the No. 2 spot, and Western Washington University was No. 3. Barry University and Mercyhurst University finished out the top five. Trinity College finished on top of the Division III poll with 10 first-place votes, while Williams College was No. 2 and Wellesley College was No. 3. Bates College and Wesleyan University rounded out the top five. Other Receiving Votes: Oregon State University 23, Michigan State University 20, Cornell University 17, University of Oklahoma 12, Northeastern University 9, Clemson University 4, Duke University 2, University of Pennsylvania 2, University of Minnesota 2, Boston University 2, University of Iowa 1. Other Receiving Votes: Philadelphia University 25. Other Receiving Votes: Lewis and Clark College 3, Smith College 1, United States Coast Guard Academy 1.